An Outlook user with two accounts in his profile had a question about searching for contacts. When I use Find a Contact and click on a contact how I can I determine which account the contact is in? I see the In folder field but it does not tell me which Account the contact is in. There are a couple of ways to find out which folder a contact is in, depending on how you search. Using the Find a Contact search field (Search People in new versions), you would open the contact and press Ctrl+Shift+F to open Advanced Find. Click the Browse button; the Contacts folder the item is in will be checked and visible. 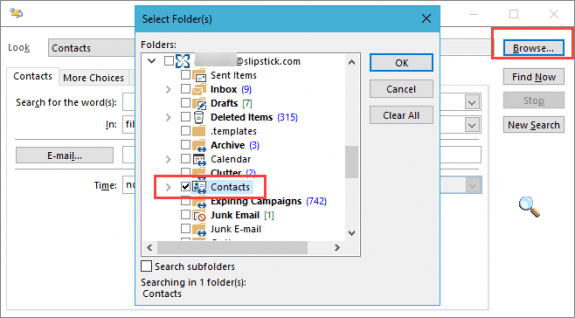 If you use Instant Search in the Contacts folder, add the Outlook Data File field to List view. This will show you the account or data file name where the contact folder is located. If you use Outlook 2013 or 2016, the contact cards in People view list the folder and account name under View Source. I'm not a fan of the contact cards but the link the contact with the folder and account names is one of the few things to like about the people view and contact cards.